Follow-Up to the FAFSA MASFAA Conference Samoset Resort October 18, 2010. 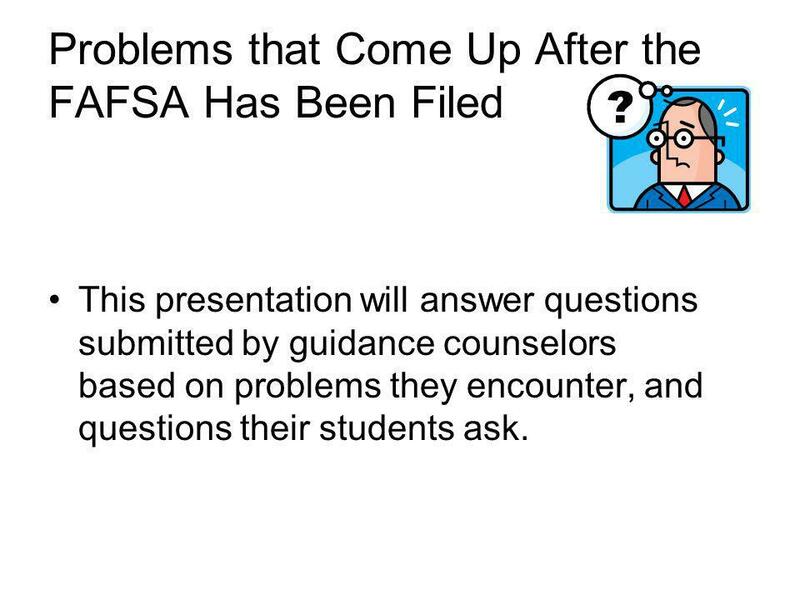 2 Problems that Come Up After the FAFSA Has Been Filed This presentation will answer questions submitted by guidance counselors based on problems they encounter, and questions their students ask. 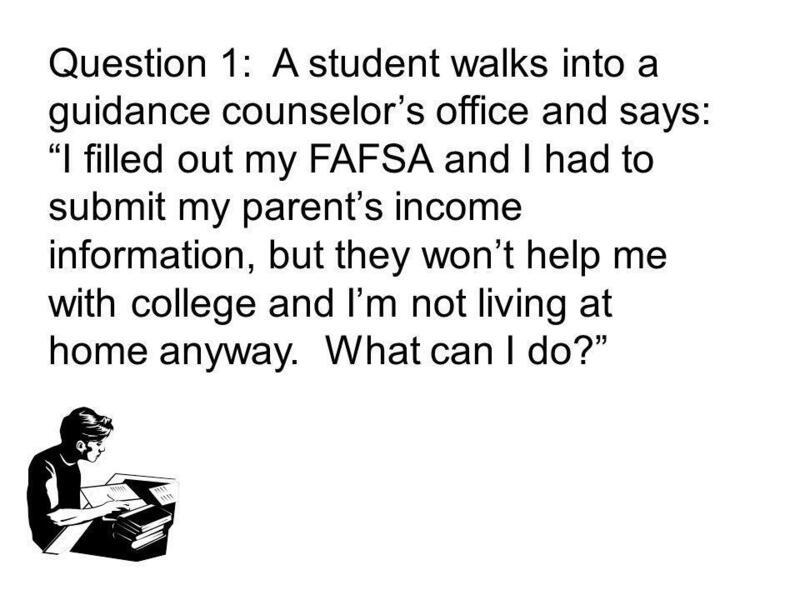 3 Question 1: A student walks into a guidance counselors office and says: I filled out my FAFSA and I had to submit my parents income information, but they wont help me with college and Im not living at home anyway. What can I do? 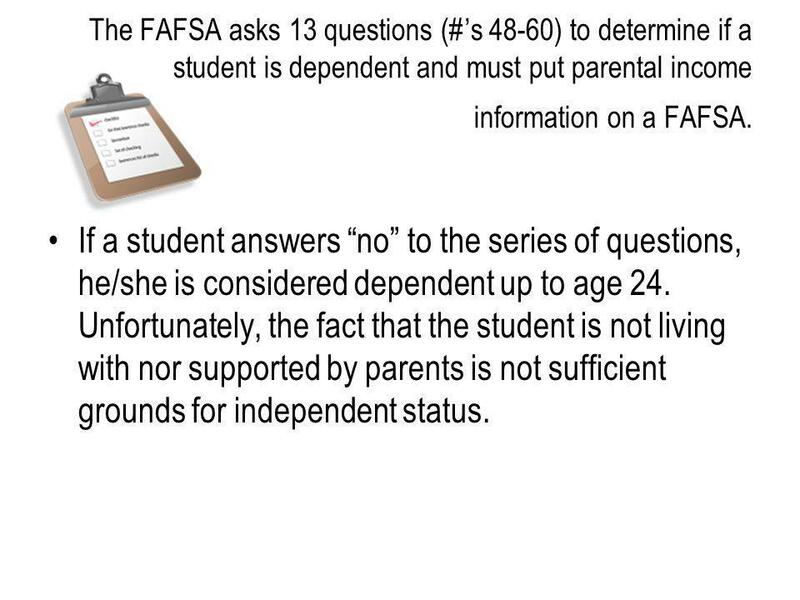 4 The FAFSA asks 13 questions (#s 48-60) to determine if a student is dependent and must put parental income information on a FAFSA. If a student answers no to the series of questions, he/she is considered dependent up to age 24. Unfortunately, the fact that the student is not living with nor supported by parents is not sufficient grounds for independent status. 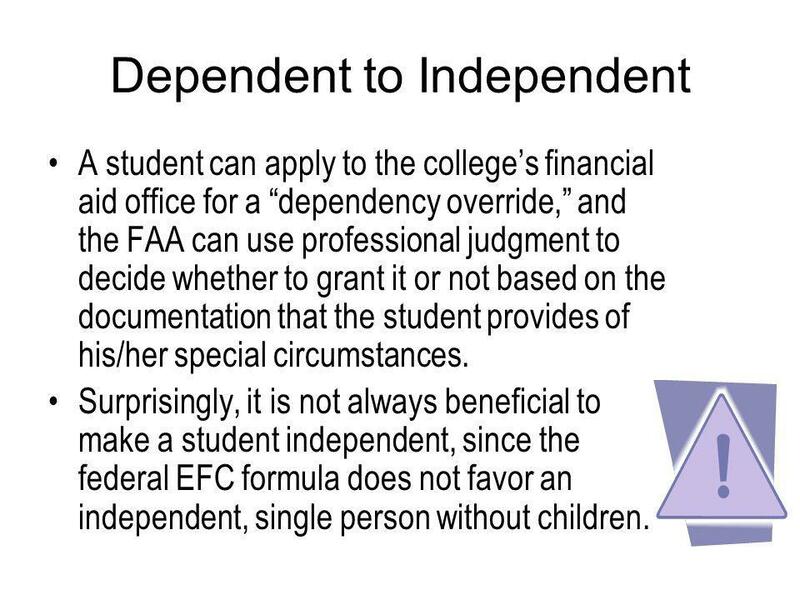 5 Dependent to Independent A student can apply to the colleges financial aid office for a dependency override, and the FAA can use professional judgment to decide whether to grant it or not based on the documentation that the student provides of his/her special circumstances. Surprisingly, it is not always beneficial to make a student independent, since the federal EFC formula does not favor an independent, single person without children. 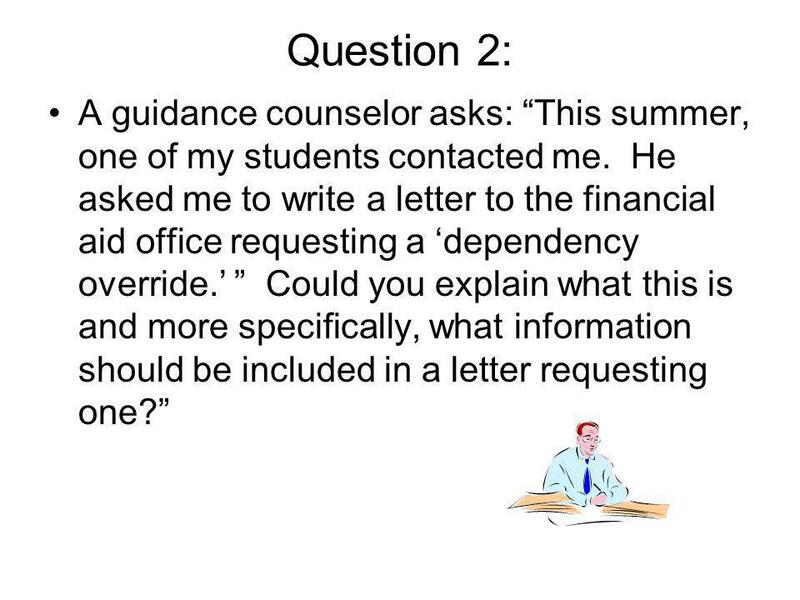 6 Question 2: A guidance counselor asks: This summer, one of my students contacted me. He asked me to write a letter to the financial aid office requesting a dependency override. Could you explain what this is and more specifically, what information should be included in a letter requesting one? 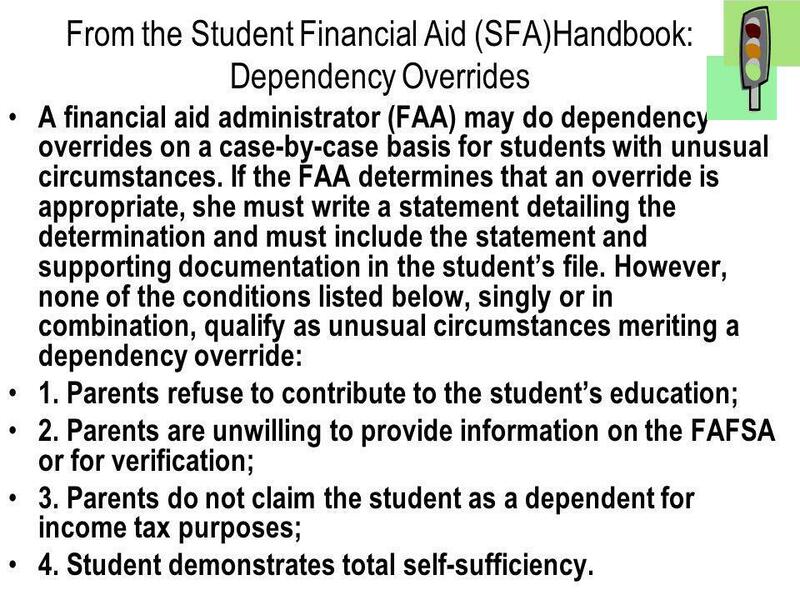 7 From the Student Financial Aid (SFA)Handbook: Dependency Overrides A financial aid administrator (FAA) may do dependency overrides on a case-by-case basis for students with unusual circumstances. If the FAA determines that an override is appropriate, she must write a statement detailing the determination and must include the statement and supporting documentation in the students file. However, none of the conditions listed below, singly or in combination, qualify as unusual circumstances meriting a dependency override: 1. Parents refuse to contribute to the students education; 2. Parents are unwilling to provide information on the FAFSA or for verification; 3. Parents do not claim the student as a dependent for income tax purposes; 4. Student demonstrates total self-sufficiency. 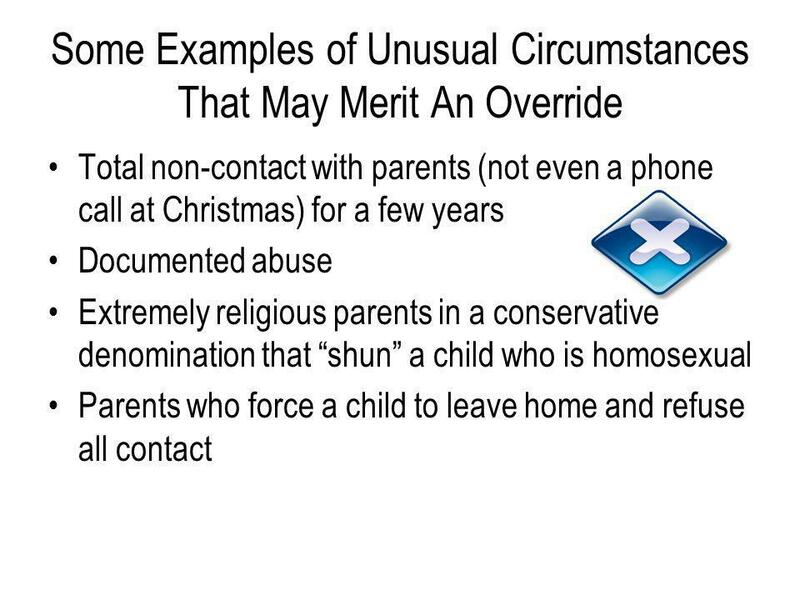 8 Unusual circumstances do include an abusive family environment or abandonment by parents and may cause any of the conditions described on the previous slide. In such cases a dependency override might be warranted. 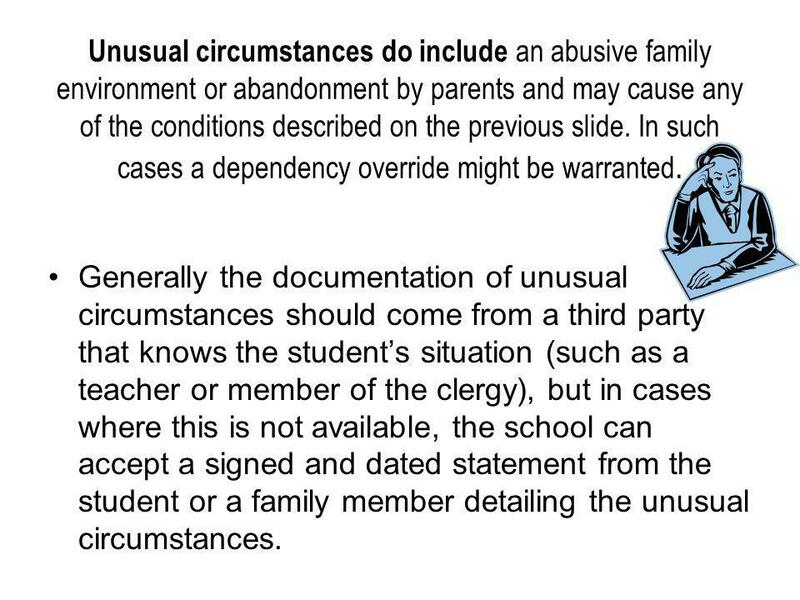 Generally the documentation of unusual circumstances should come from a third party that knows the students situation (such as a teacher or member of the clergy), but in cases where this is not available, the school can accept a signed and dated statement from the student or a family member detailing the unusual circumstances. 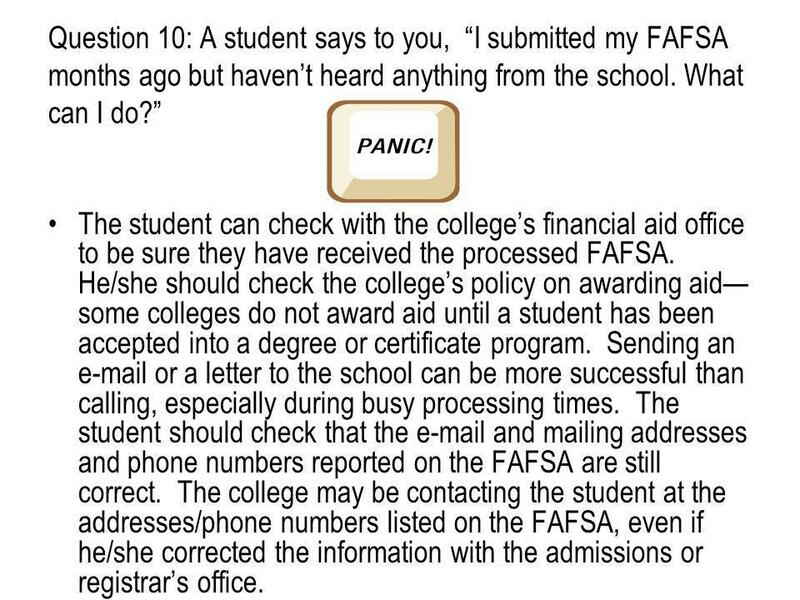 10 Question 3: A student asks you, What can I do when my parents refuse to fill out their part of my FAFSA? 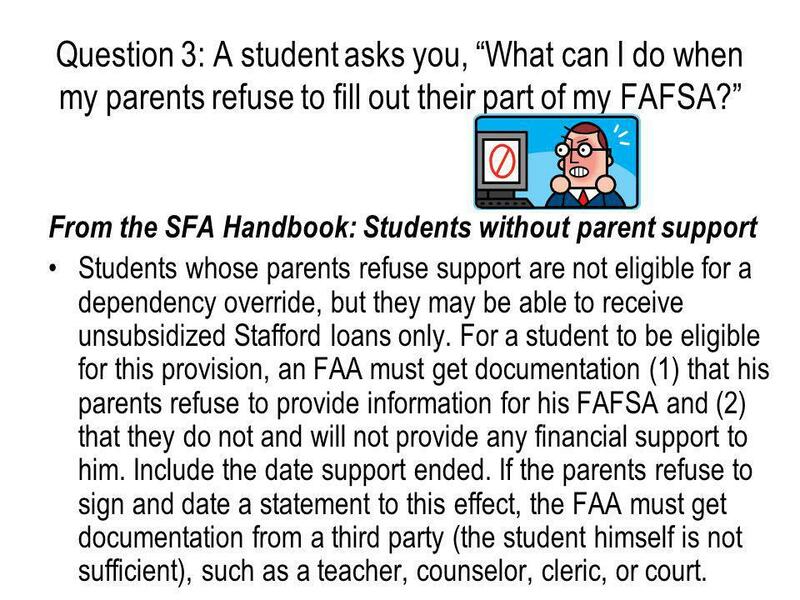 From the SFA Handbook: Students without parent support Students whose parents refuse support are not eligible for a dependency override, but they may be able to receive unsubsidized Stafford loans only. 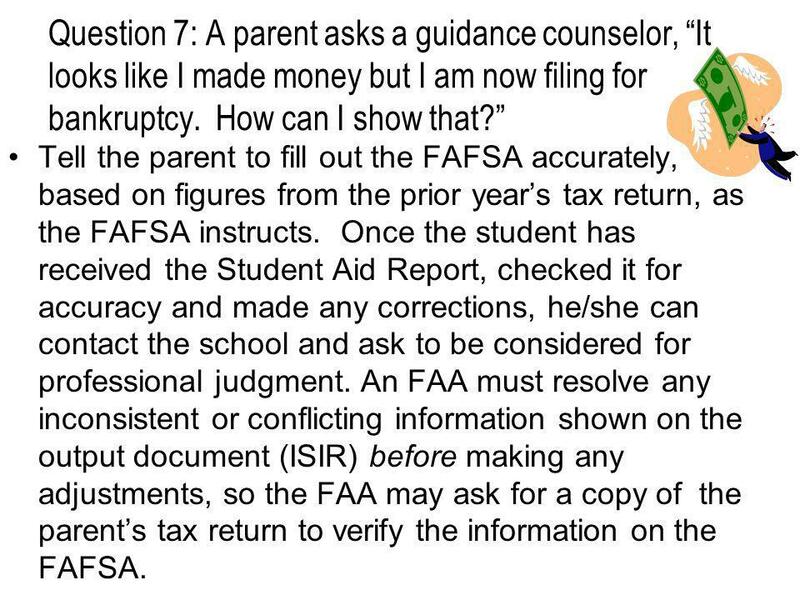 For a student to be eligible for this provision, an FAA must get documentation (1) that his parents refuse to provide information for his FAFSA and (2) that they do not and will not provide any financial support to him. Include the date support ended. If the parents refuse to sign and date a statement to this effect, the FAA must get documentation from a third party (the student himself is not sufficient), such as a teacher, counselor, cleric, or court. 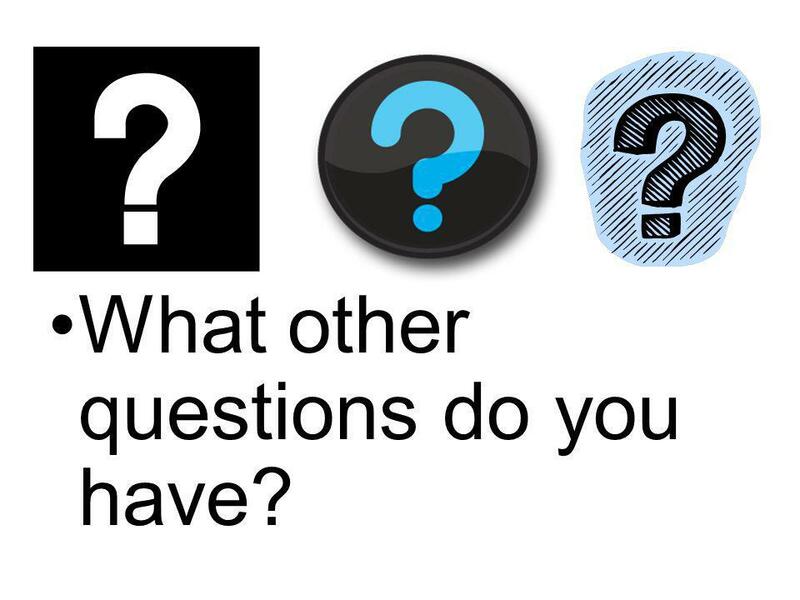 12 Question 4: A guidance counselor asks, What do you do when a non-custodial parent is uncooperative (as with the CSS profile)? 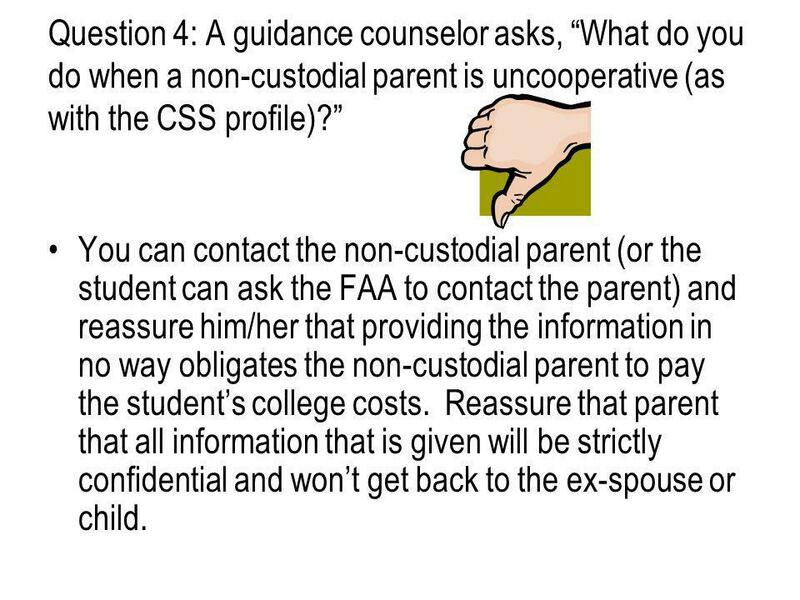 You can contact the non-custodial parent (or the student can ask the FAA to contact the parent) and reassure him/her that providing the information in no way obligates the non-custodial parent to pay the students college costs. Reassure that parent that all information that is given will be strictly confidential and wont get back to the ex-spouse or child. 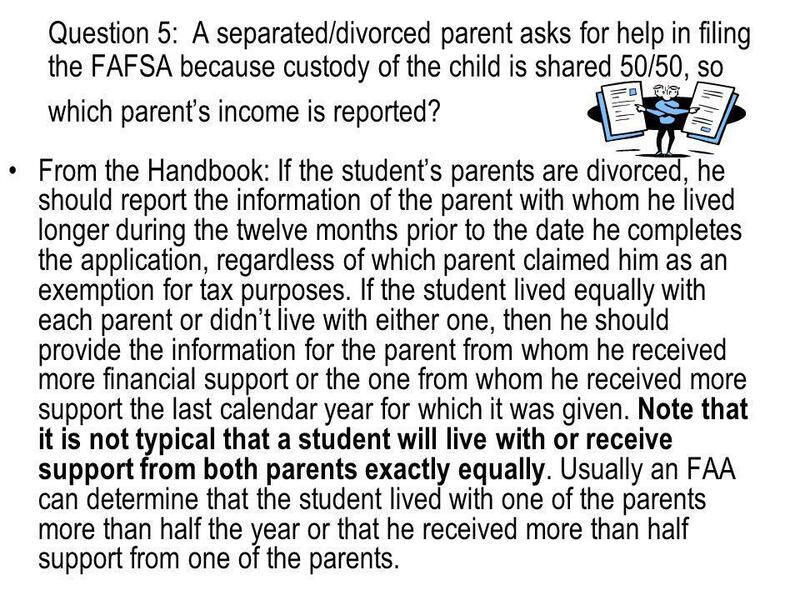 13 Question 5: A separated/divorced parent asks for help in filing the FAFSA because custody of the child is shared 50/50, so which parents income is reported? 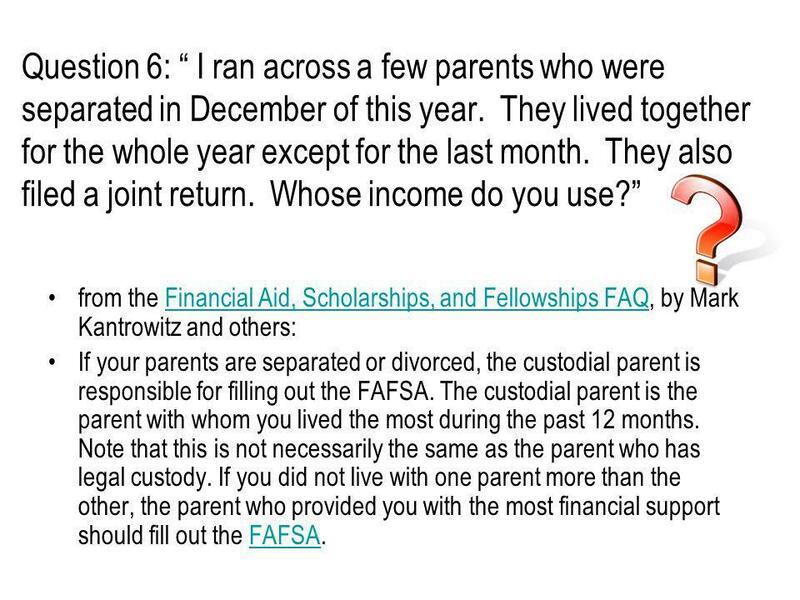 From the Handbook: If the students parents are divorced, he should report the information of the parent with whom he lived longer during the twelve months prior to the date he completes the application, regardless of which parent claimed him as an exemption for tax purposes. If the student lived equally with each parent or didnt live with either one, then he should provide the information for the parent from whom he received more financial support or the one from whom he received more support the last calendar year for which it was given. Note that it is not typical that a student will live with or receive support from both parents exactly equally. 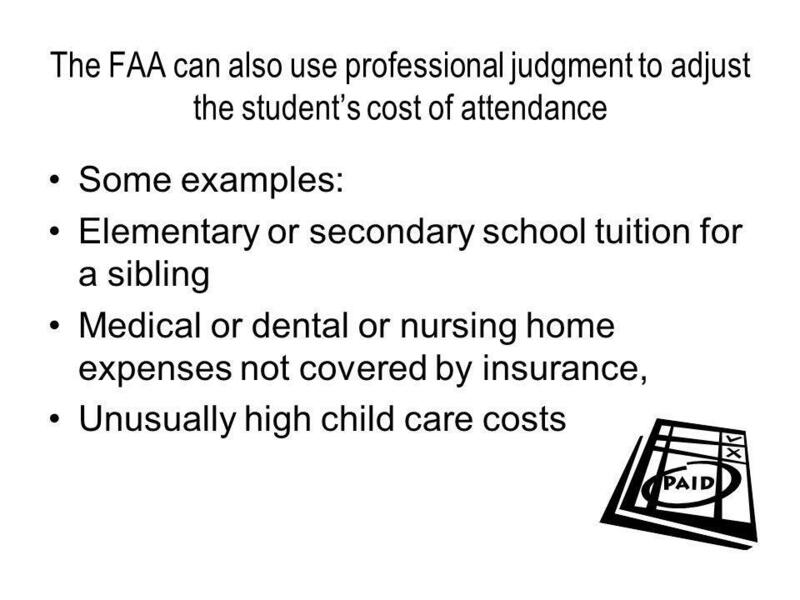 Usually an FAA can determine that the student lived with one of the parents more than half the year or that he received more than half support from one of the parents. 14 Separation of the students parents A couple need not be legally separated to be considered separatedthey may deem themselves informally separated when one of the partners has left the household for an indefinite period and the marriage is severed. 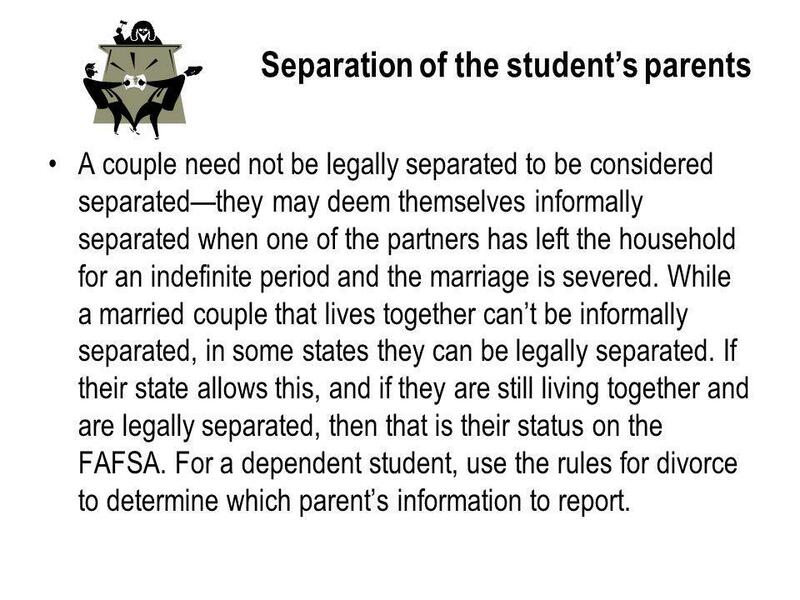 While a married couple that lives together cant be informally separated, in some states they can be legally separated. If their state allows this, and if they are still living together and are legally separated, then that is their status on the FAFSA. 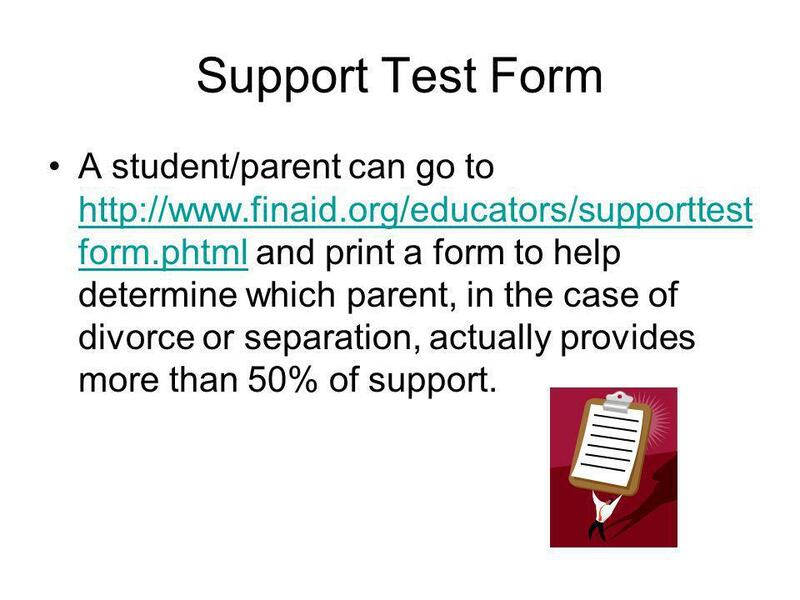 For a dependent student, use the rules for divorce to determine which parents information to report. 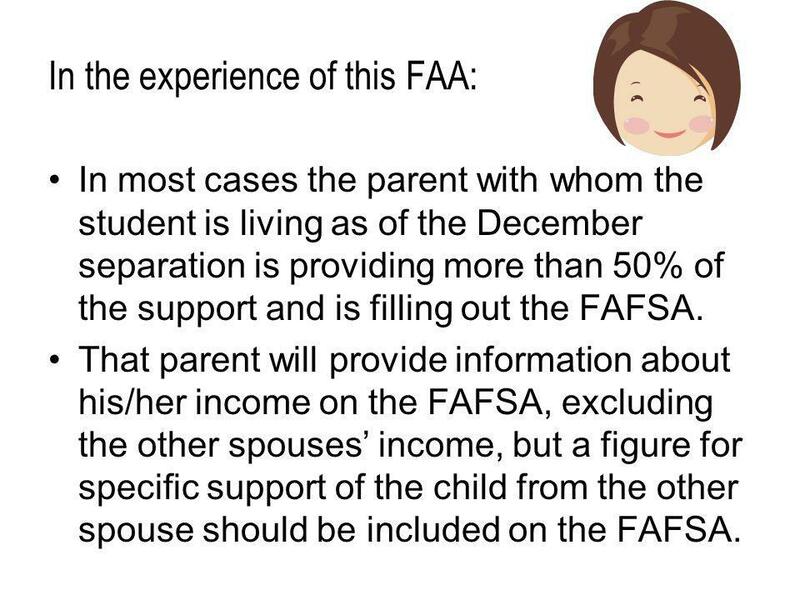 17 In the experience of this FAA: In most cases the parent with whom the student is living as of the December separation is providing more than 50% of the support and is filling out the FAFSA. That parent will provide information about his/her income on the FAFSA, excluding the other spouses income, but a figure for specific support of the child from the other spouse should be included on the FAFSA. 18 Question 7: A parent asks a guidance counselor, It looks like I made money but I am now filing for bankruptcy. How can I show that? Tell the parent to fill out the FAFSA accurately, based on figures from the prior years tax return, as the FAFSA instructs. Once the student has received the Student Aid Report, checked it for accuracy and made any corrections, he/she can contact the school and ask to be considered for professional judgment. 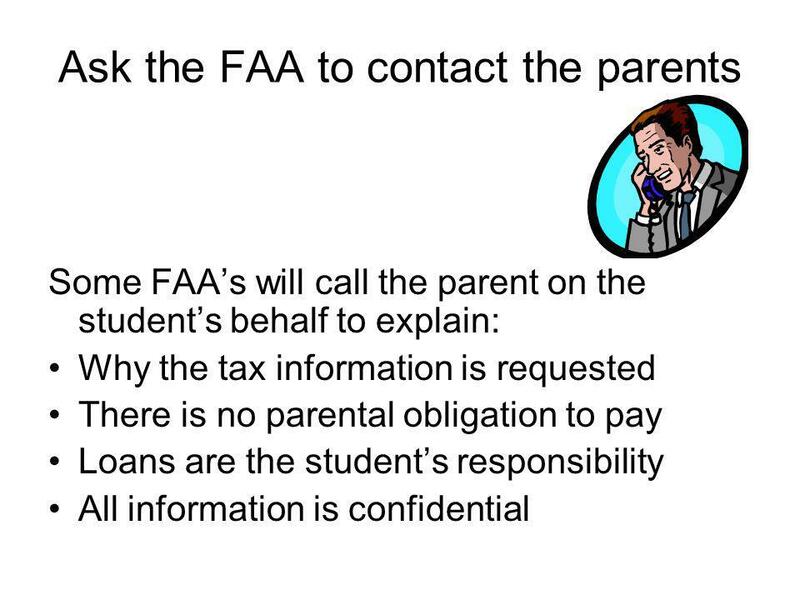 An FAA must resolve any inconsistent or conflicting information shown on the output document (ISIR) before making any adjustments, so the FAA may ask for a copy of the parents tax return to verify the information on the FAFSA. 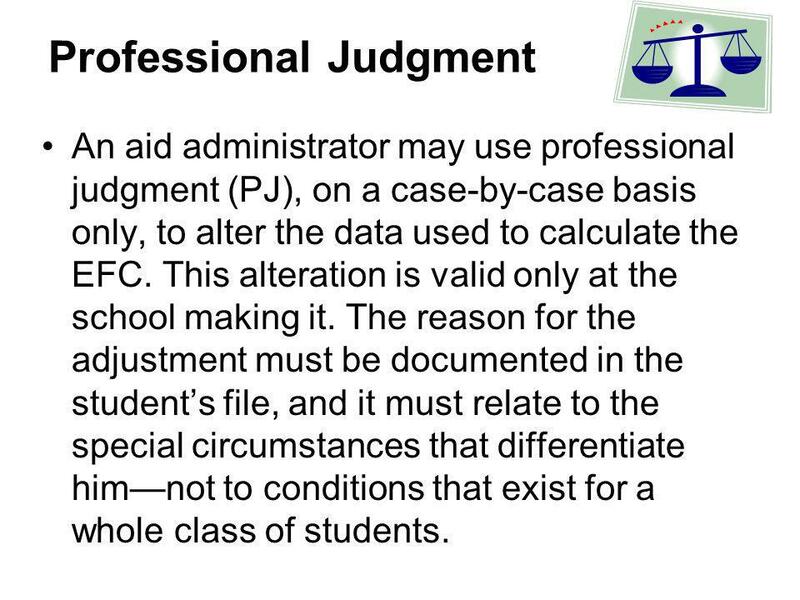 19 Professional Judgment An aid administrator may use professional judgment (PJ), on a case-by-case basis only, to alter the data used to calculate the EFC. This alteration is valid only at the school making it. The reason for the adjustment must be documented in the students file, and it must relate to the special circumstances that differentiate himnot to conditions that exist for a whole class of students. 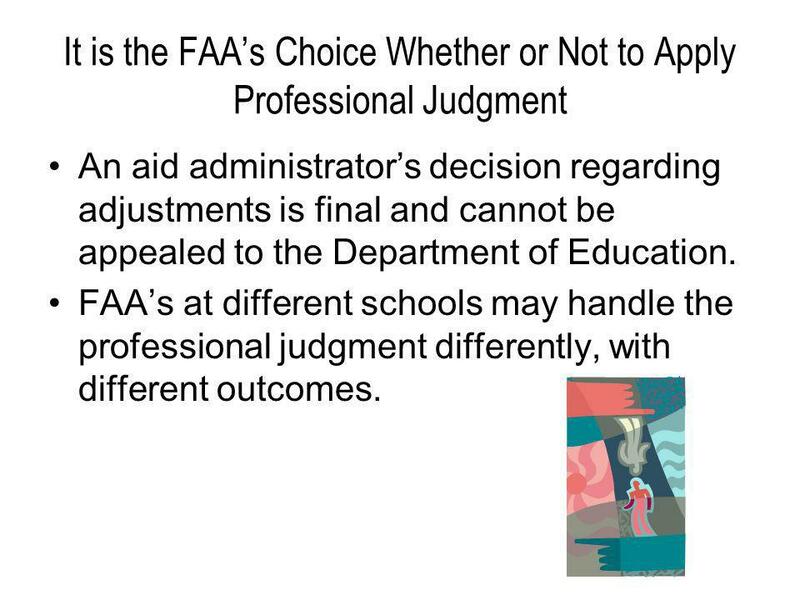 22 It is the FAAs Choice Whether or Not to Apply Professional Judgment An aid administrators decision regarding adjustments is final and cannot be appealed to the Department of Education. FAAs at different schools may handle the professional judgment differently, with different outcomes. 23 Question 8: A parent asks a guidance counselor: Is it really safe to give your Social Security number on the internet? Sites such as www.pin.ed.gov and www.fafsa.ed.gov are secure sites. Their addresses begin with https://.www.pin.ed.gov www.fafsa.ed.gov Providing a Social Security number on a secure government site is safe. However, a student or parent should not share their government PIN number with anyone or leave it where someone else could see it. 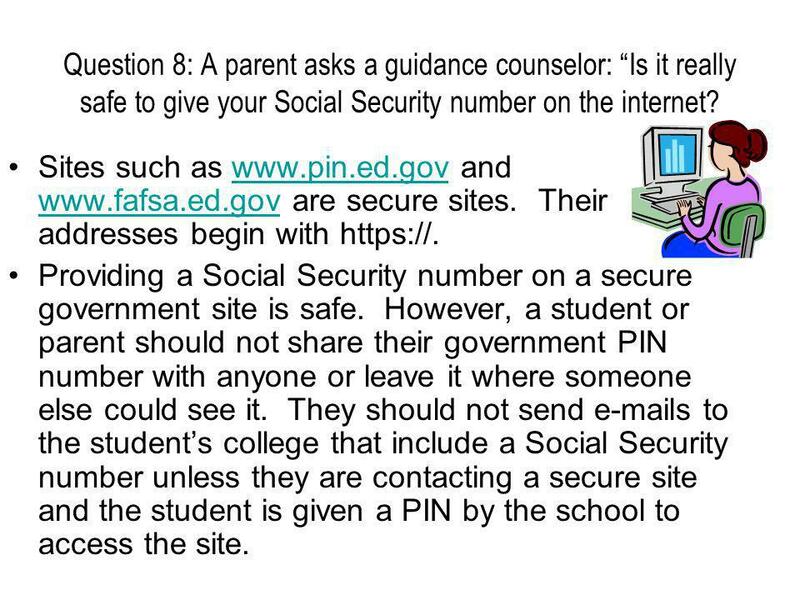 They should not send e-mails to the students college that include a Social Security number unless they are contacting a secure site and the student is given a PIN by the school to access the site. 24 Question 9: A student says to you, I filed way back but I havent heard a thing from the Dept. of Ed. concerning my FAFSA. Tell the student, You should receive a Student Aid Report within a few days of filling out a FAFSA. It will list all the answers on your FAFSA, with spaces provided for you to enter corrections if necessary. If you do not receive a Student Aid Report or any e- mails or letters from the Department of Education, you can call 1-800-4-fed aid (1-800-433-3243) to check on its status. You can also contact the College to see if they have received the processed FAFSA (called an ISIR). 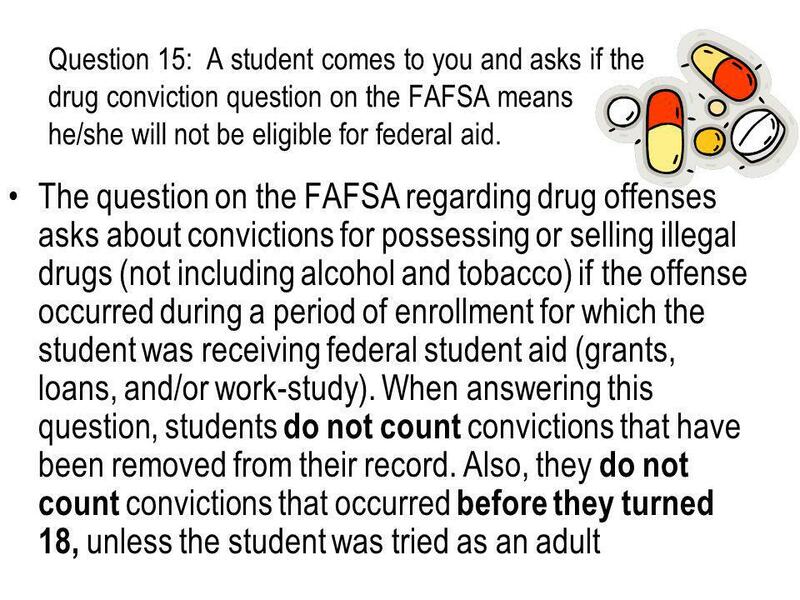 26 Question 10: A student says to you, I submitted my FAFSA months ago but havent heard anything from the school. What can I do? 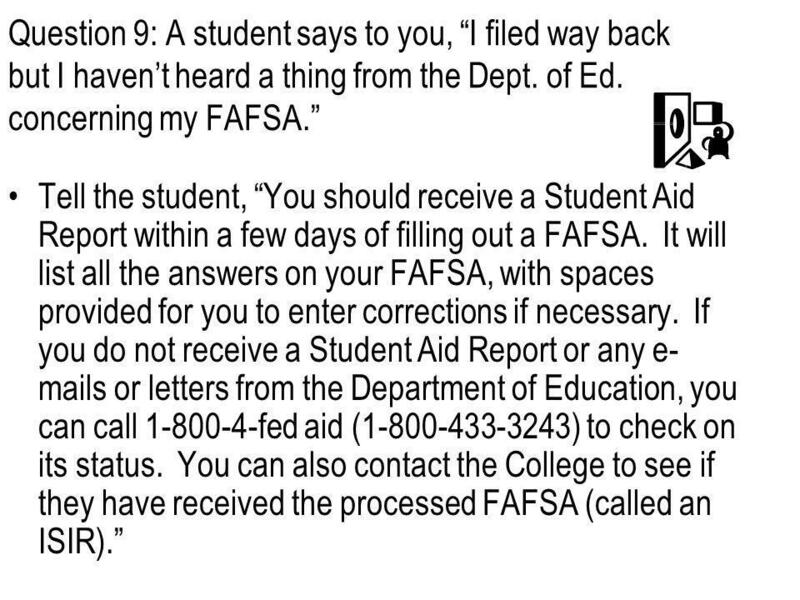 The student can check with the colleges financial aid office to be sure they have received the processed FAFSA. He/she should check the colleges policy on awarding aid some colleges do not award aid until a student has been accepted into a degree or certificate program. Sending an e-mail or a letter to the school can be more successful than calling, especially during busy processing times. The student should check that the e-mail and mailing addresses and phone numbers reported on the FAFSA are still correct. 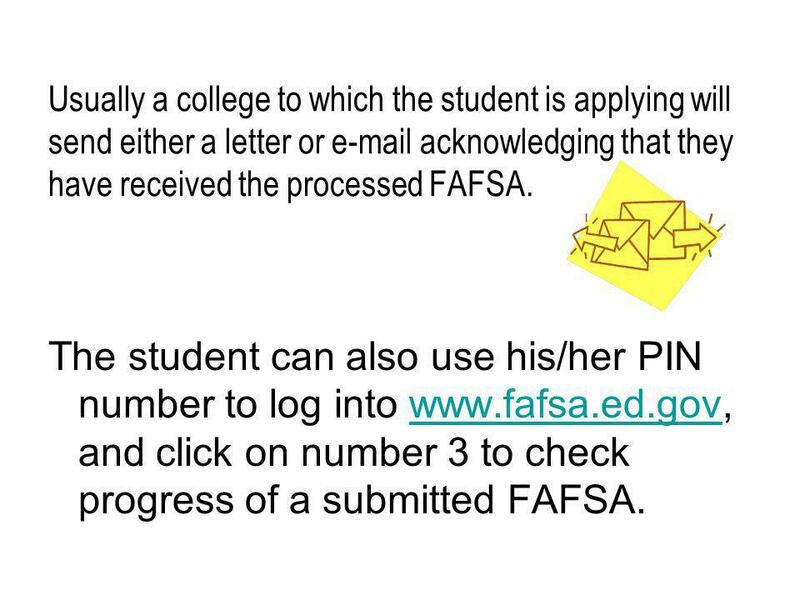 The college may be contacting the student at the addresses/phone numbers listed on the FAFSA, even if he/she corrected the information with the admissions or registrars office. 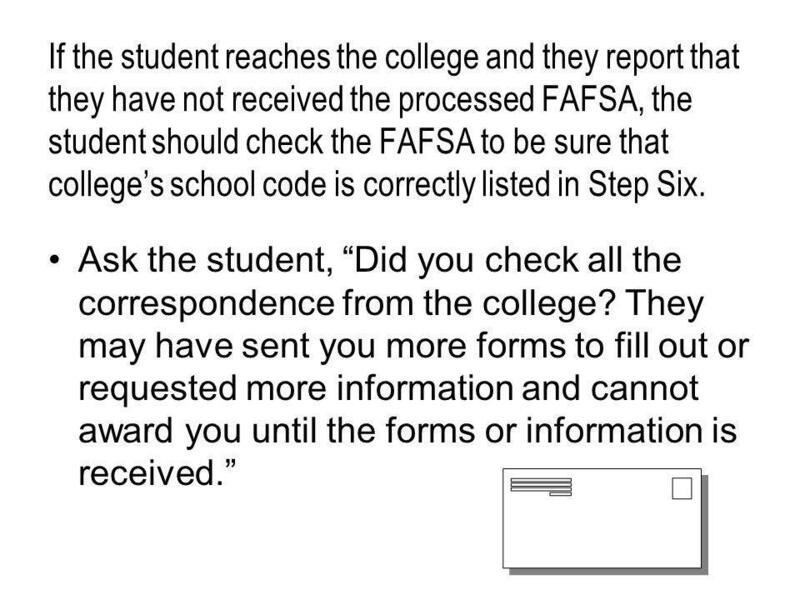 27 If the student reaches the college and they report that they have not received the processed FAFSA, the student should check the FAFSA to be sure that colleges school code is correctly listed in Step Six. Ask the student, Did you check all the correspondence from the college? They may have sent you more forms to fill out or requested more information and cannot award you until the forms or information is received. 28 Question 11: How do the loans work? What is subsidized and unsubsidized? Most financial aid offices will package in a loan if they cannot meet need with grants only. 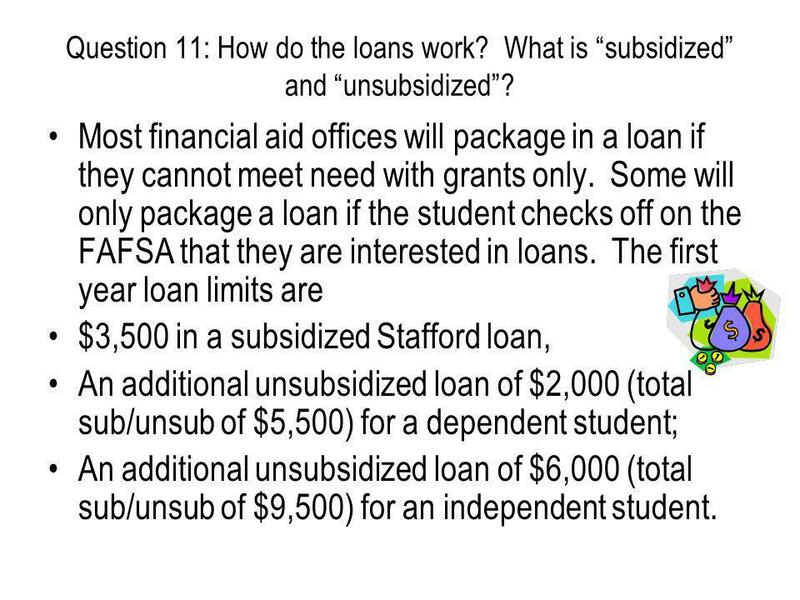 Some will only package a loan if the student checks off on the FAFSA that they are interested in loans. The first year loan limits are $3,500 in a subsidized Stafford loan, An additional unsubsidized loan of $2,000 (total sub/unsub of $5,500) for a dependent student; An additional unsubsidized loan of $6,000 (total sub/unsub of $9,500) for an independent student. 29 Subsidized means that interest is not charged while a student is in school at least half-time, and for a six-month grace period after the student graduates or drops below half-time. 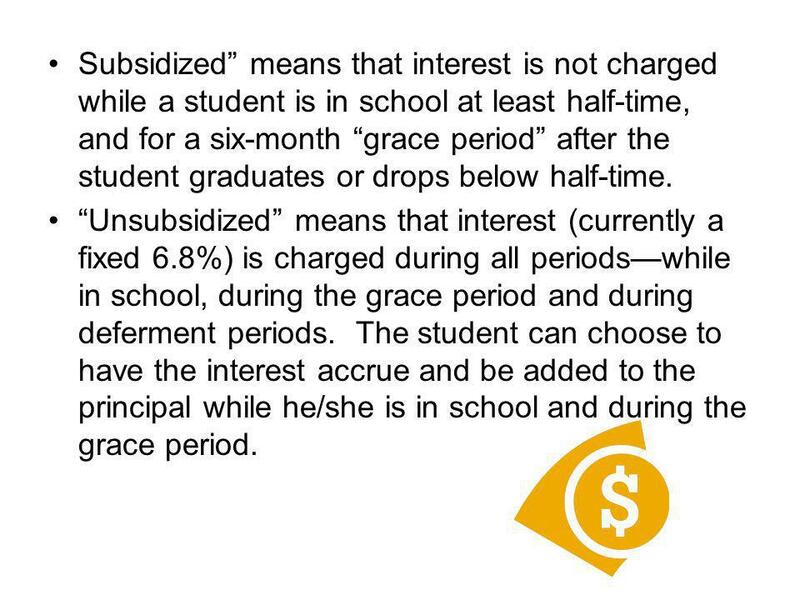 Unsubsidized means that interest (currently a fixed 6.8%) is charged during all periodswhile in school, during the grace period and during deferment periods. The student can choose to have the interest accrue and be added to the principal while he/she is in school and during the grace period. 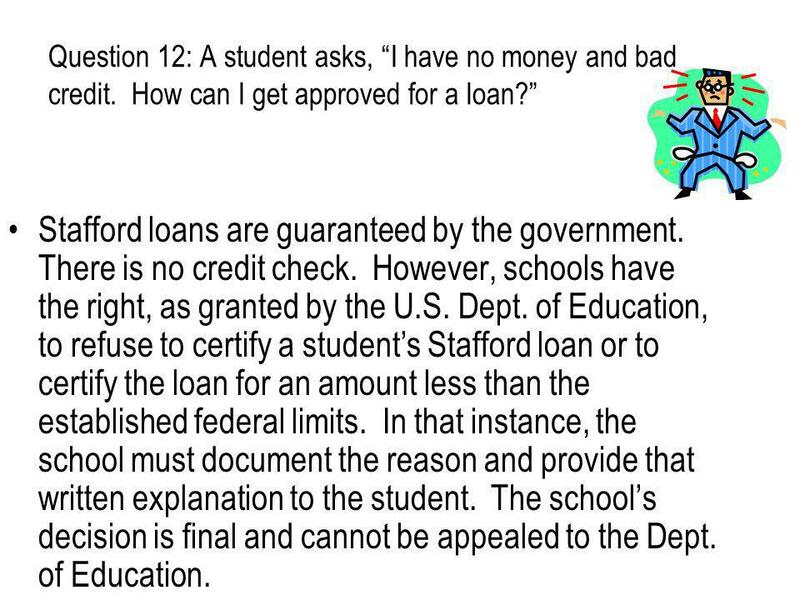 30 Question 12: A student asks, I have no money and bad credit. How can I get approved for a loan? Stafford loans are guaranteed by the government. There is no credit check. However, schools have the right, as granted by the U.S. Dept. of Education, to refuse to certify a students Stafford loan or to certify the loan for an amount less than the established federal limits. In that instance, the school must document the reason and provide that written explanation to the student. The schools decision is final and cannot be appealed to the Dept. of Education. 31 PLUS Loans The government offers PLUS loans to parents at a fixed rate of 7.9%. These are not deferred until the student graduates, and they are subject to a credit check. 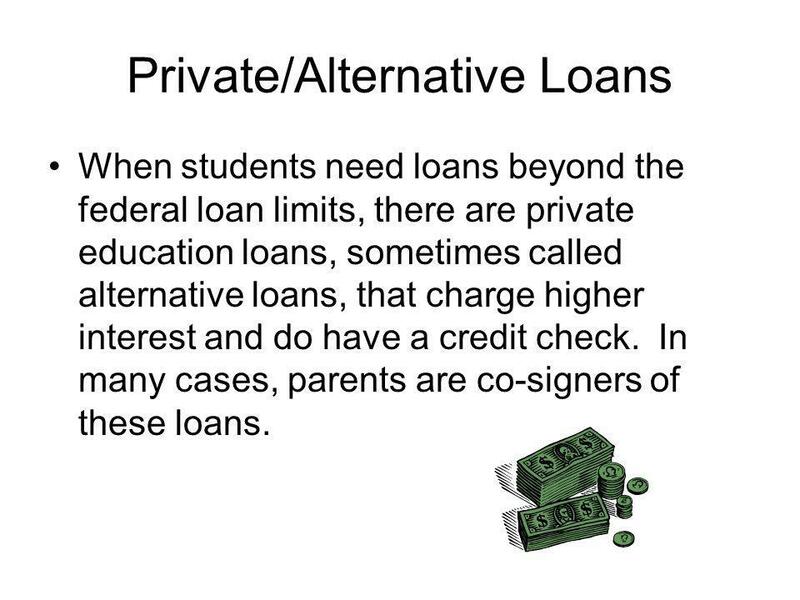 32 Private/Alternative Loans When students need loans beyond the federal loan limits, there are private education loans, sometimes called alternative loans, that charge higher interest and do have a credit check. In many cases, parents are co-signers of these loans. 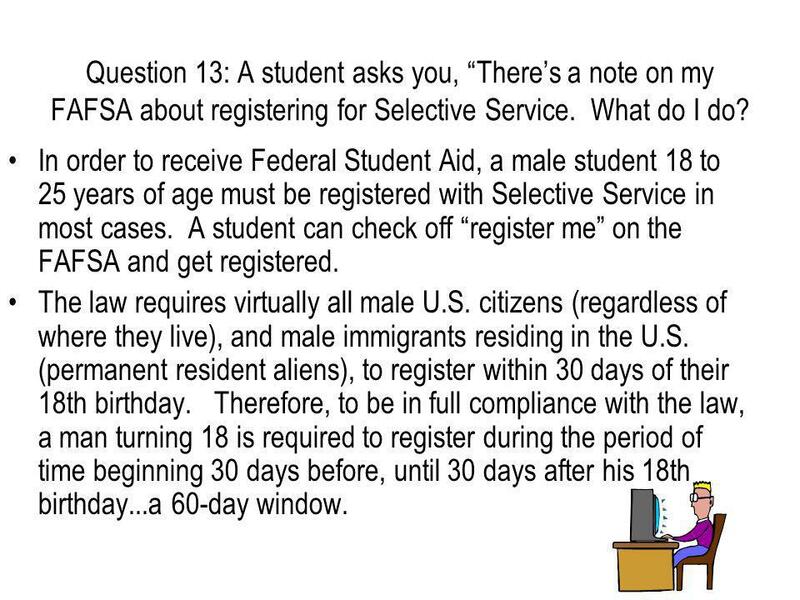 33 Question 13: A student asks you, Theres a note on my FAFSA about registering for Selective Service. What do I do? 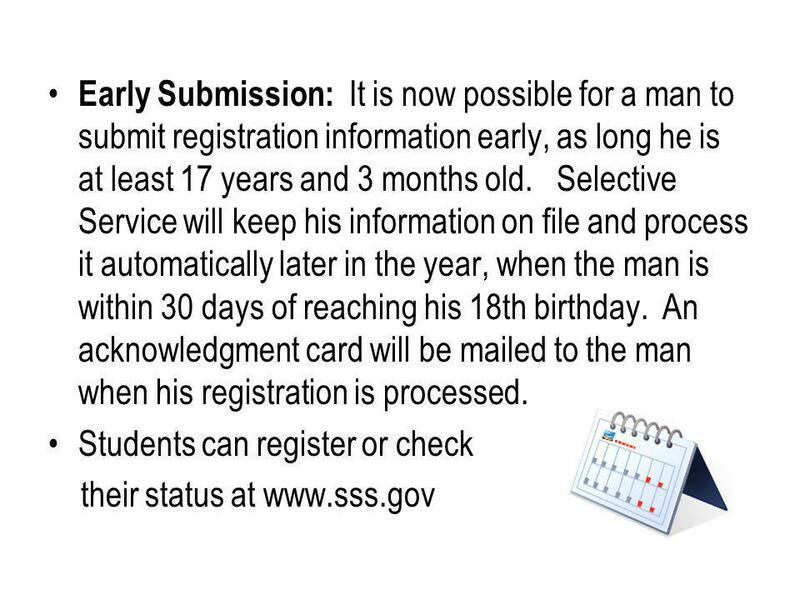 In order to receive Federal Student Aid, a male student 18 to 25 years of age must be registered with Selective Service in most cases. A student can check off register me on the FAFSA and get registered. The law requires virtually all male U.S. citizens (regardless of where they live), and male immigrants residing in the U.S. (permanent resident aliens), to register within 30 days of their 18th birthday. Therefore, to be in full compliance with the law, a man turning 18 is required to register during the period of time beginning 30 days before, until 30 days after his 18th birthday...a 60-day window. 34 . 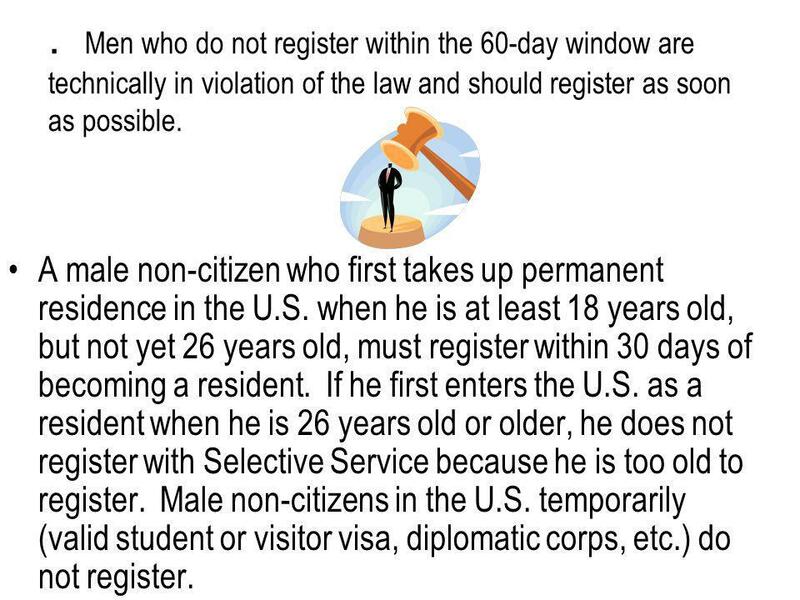 Men who do not register within the 60-day window are technically in violation of the law and should register as soon as possible. A male non-citizen who first takes up permanent residence in the U.S. when he is at least 18 years old, but not yet 26 years old, must register within 30 days of becoming a resident. If he first enters the U.S. as a resident when he is 26 years old or older, he does not register with Selective Service because he is too old to register. Male non-citizens in the U.S. temporarily (valid student or visitor visa, diplomatic corps, etc.) do not register. 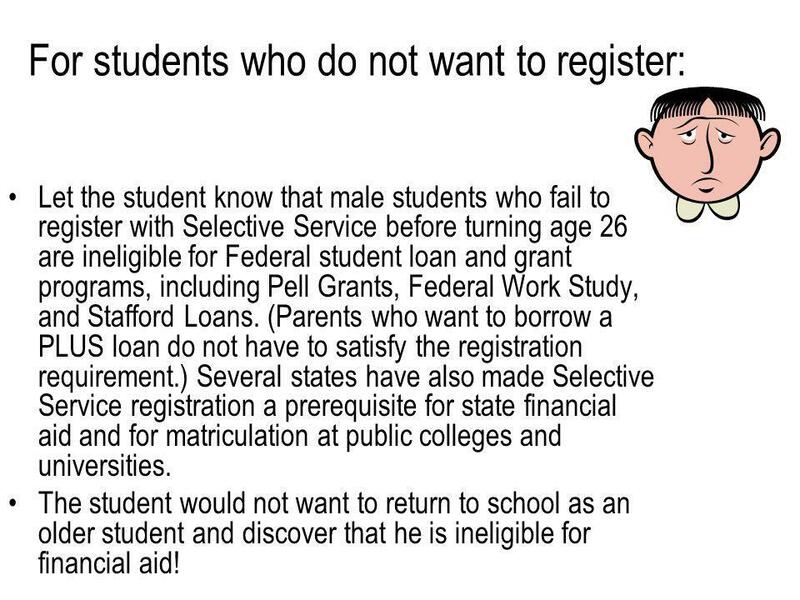 36 For students who do not want to register: Let the student know that male students who fail to register with Selective Service before turning age 26 are ineligible for Federal student loan and grant programs, including Pell Grants, Federal Work Study, and Stafford Loans. 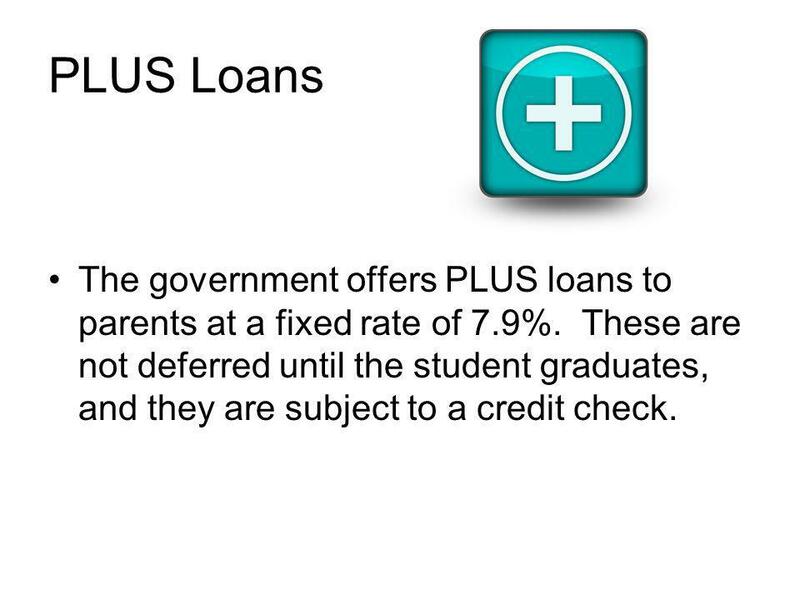 (Parents who want to borrow a PLUS loan do not have to satisfy the registration requirement.) Several states have also made Selective Service registration a prerequisite for state financial aid and for matriculation at public colleges and universities. The student would not want to return to school as an older student and discover that he is ineligible for financial aid! 37 Question 14: A student looks at his/her award letter and says, This award cant be right. How do I appeal this decision? Most schools have some kind of appeal or review formthe student should ask the Financial Aid Administrator. As one FAA put it, successful appeals are rooted in data changes. That means that the appeal is usually based on a loss of income not reflected by the prior year tax form. Therefore the appeal of the award decision is actually an appeal for professional judgment. The parent will be given a professional judgment appeal form and asked to document the change such as loss of job, high medical expenses, etc. 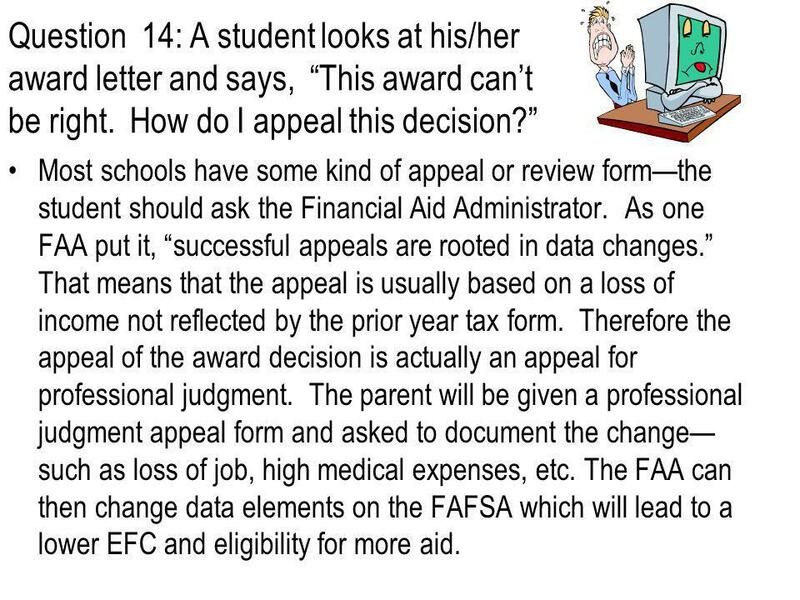 The FAA can then change data elements on the FAFSA which will lead to a lower EFC and eligibility for more aid. 39 What other questions do you have? 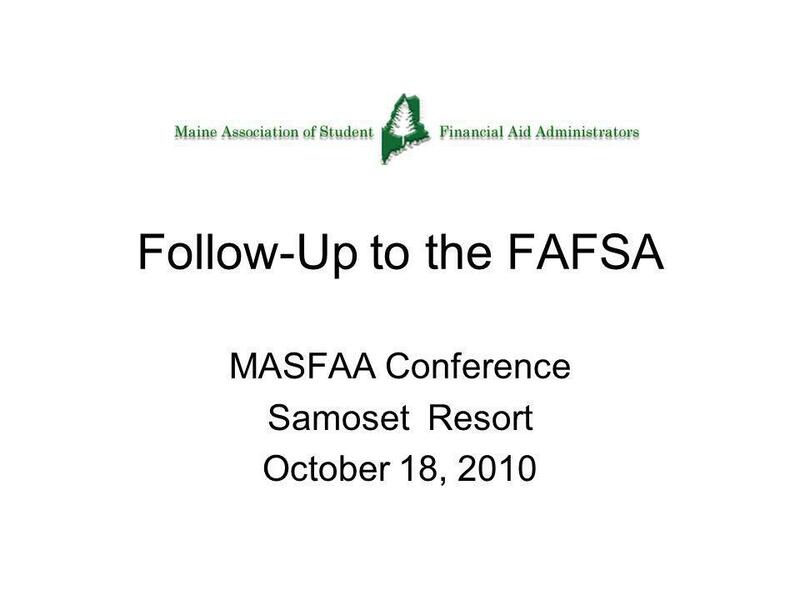 Download ppt "Follow-Up to the FAFSA MASFAA Conference Samoset Resort October 18, 2010." PROFESSIONAL JUDGMENT Charting the course. 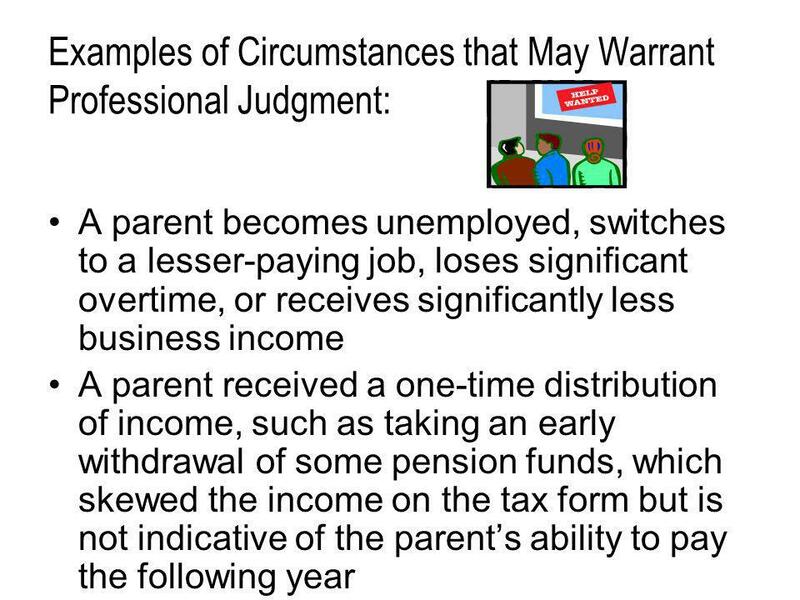 Professional Judgment - Definition A Financial Aid Officers discretion to adjust a students reported information. HOWARD COMMUNITY COLLEGE FINANCIAL AID SERVICES You Can Afford College! 1. National Association of Student Financial Aid Administrators © NASFAA 2011 What You Need to Know about Financial Aid. Verification Sailing away the winter blues with ISFAA … 2015 Winter Conference. Financial Aid 101 Hal J. Wilkinson K-12 School Representative Georgia Student Finance Commission. Howard Community College Financial Aid Services 1. Karen Krause University of Texas at Arlington. Authority to Make Professional Judgment Decisions Section 479A of the Higher Education Act No specific. Help students pay for college Achieved by: - Evaluating family's ability to pay for educational costs - Distributing limited resources in a fair and equitable. What Happens Next? Financial Aid 101 Mila Tappan, FAME Outreach Representative October 10, 2008. Financial Aid & College Financing Copyright ® 2013 Finance Authority of Maine. ILASFAA Annual Conference April 16-18, 2008 Common FAFSA Errors And how to avoid them. 1 Verification Fall 2008 NCASFAA Winston-Salem Emily Bliss and Kathy Fritz.